LOL, so she is eating your noodles at a restaurant? That means she just likes the restaurants for the ambience, but she prefers your cooking... :D That is a great compliment.... Your gifts look so cute... Happy Mother's day Sandeepa! Isn't it lovely when ur kid gives you such innocent surprises!! Happy Mother's Day Sandeepa !! How cute is that! Happy Mother's Day! I have never made maggi that way; does it taste very different from the standard method ? And why did you use only half the Masala ? It's funny how many different types of maggi that are available these days: rice, chinese,atta, and even sambhar flavored! Very nice piece, Sandeepa! Am trying for the book at the library, all copies always seem to be in circulation! Little S's craft was nice. happy mother's day!! seems like a lovely day spent in the company of loved ones!! Looks like you had a great Sunday+Mommy's day . 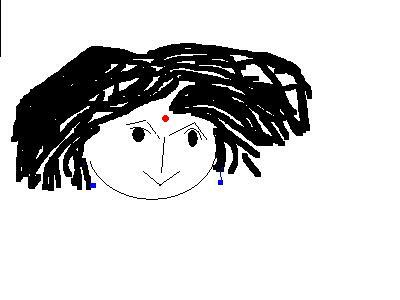 Happy Mothers' Day Sandeepa. Ican see your little one is growing up fast, and objectively she is pretty focused..... reason why she loves her Mom. Jokes apart, I was so jealous to see the green and know you were enjoying the cold chill in the wind. We are scortching in 40 to 42 degree Celsius for past 3 weeks. Schools are closing fast for summer vacation. My little R being in grade 6has got a respite of reduced school hours. So he does avoid the heat at 2pm and suffers that of 12 noon. I have bought a copy of Unaccustomed earth and is hopeful, next weekend onwards would be able to read it up, once his school closes. Good Monday morning to ya my good lady!! Still waiting for the Indiana Jones, may be next week. Expecting breakfast from men even on Mother's Day is an exercise in futility Sandeepa :) but atleast D more than made it up with the book gift guess what mine did ;) It poured here the whole day. 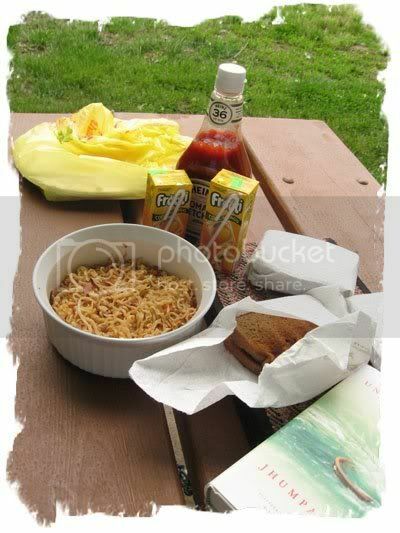 Maggie Noodles and picnic is a great combo. That should have read S's art looks beautiful - to warm mommy's heart on a dull day. Hey please tell us your review of Jhumpa's new book...would like to get my hands on it. Nice gift!! LOL! My husband was supposed to make dinner and he made chicken curry, potatoes and rice...for a vegetarian?! :) YES! men are thick!!! that's a nice post, sandeepa! belated happy mother's day to you too! S cracks me up. she's a cutie. a smart cutie. happy mother's day to you. The seasoning I used half because S was supposed to have it and also with all that onion, egg, veggies, you don't miss the seasoning at all. I envy you, when my Ma talks about the heat, how I yearn for it !!!! I would give anything for a warmer weather right now. All kids will have the same effect, I am telling you. S has her priorities in the right place! 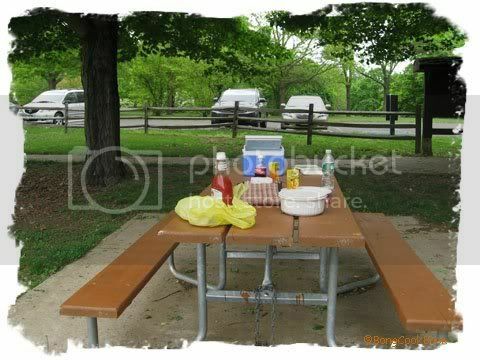 Glad you had a great Mother's Day and a picnic in the park! How sweet....:) She loves your cooking over restaurant food! That should make you proud!! Love that poem on the second picture. Just stumbled upon ur blog while trying to find an easy aaloo posto recipe. With my mom being out of town I have been trying to cook with disastrous results. Your blog, I am hoping is gonna help me out. that is so cute Sandeepa. You daughter makes everything special :) Lau Bori aar Lauri chingri too look fantastic! I read Unaccustomed Earth and thought that it was uneven. I loved some stories and didn't think much of others. Happy mother's day! preschool gifts are so cute, so true to heart!! U R so right about husbands being a little thick in the head regarding days when it is quite obvious that the lady needs surprises....ha ha. 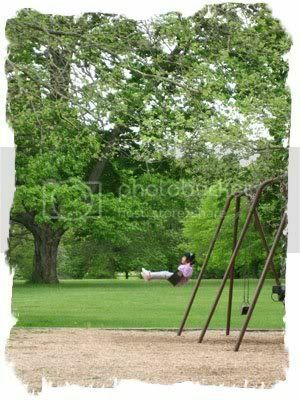 BTW, the park looks so green...I wish I was swinging there:) Good post! what a delightful post! How adorable that she said she loves mom coz u make her good food! :) Love her pic on the swing! Give her a hig from me, will ya? Happy mother's Day Sandeepa.Ram likes maggi too..:).I have to try your way too.Again, me too got that special gift from Ram.It was so sweet.He had written my age as '5' years old..:D.(it was way better than the other mother who got '59' on her poster).Last but not least, left you a little something in my blog come and check it out..
Oh that picture with her hand rprints are sooo sweet. 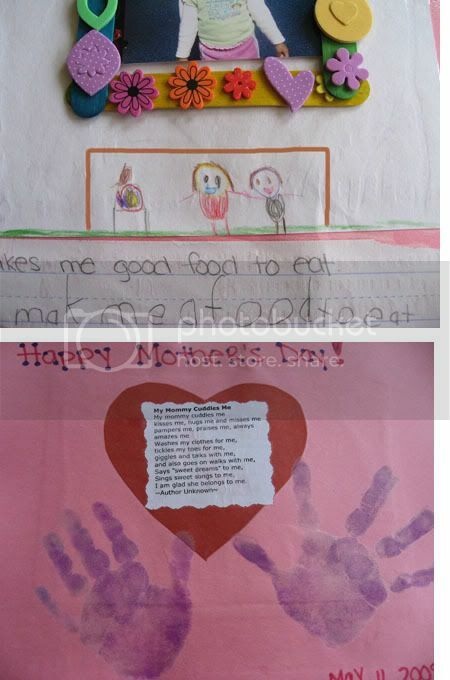 My son gave me similar one for mothers day. He made at school. THANKS SANDEEPA,..FOR THE SUGGESTION TO WASH OFF THE COLOUR,..I AM BACK...NICEPOST,..ENJOYD READING IT,..
Hope you had a great mothers' day.